Facebook ‘s rolling out the next stage of its expanded transparency push, with users who manage ‘large’ Facebook Pages being asked to go through a new authorization process before they’ll be able to continue publishing posts on the Page. 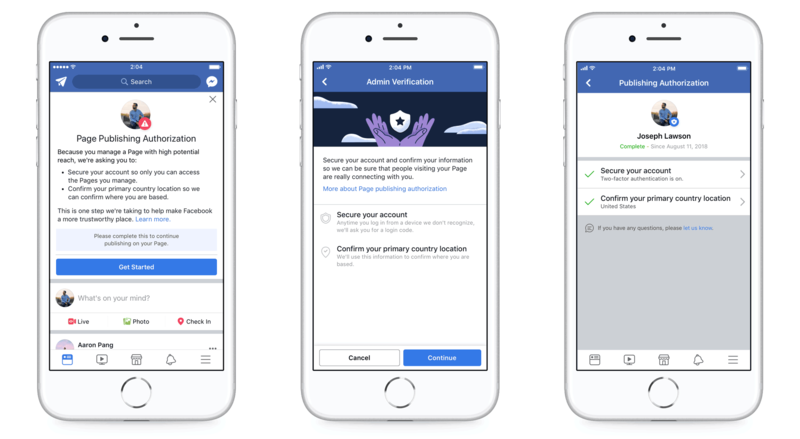 As outlined in the above example flow, the authorization process will prompt users who manage Pages with large potential reach to secure their account with two-factor authentication, and confirm their primary country location. The process is rolling out first to US businesses, with Facebook looking to expand the system more broadly over time. Facebook doesn’t specifically explain how ‘large’ a Page needs to be to qualify, but if your Page manager/s do require authorization, they’ll receive a notice at the top of their News Feed to begin the process. This Page banner will be visible on your affected Pages until the required users have completed all steps of Page Publishing Authorization - if they don’t complete authorization by the deadline provided in your initial notification, they’ll lose the ability to post as the Page. The effort’s part of Facebook’s push “prevent organizations and individuals from creating accounts which mislead people about who they are or what they're doing.” This comes on the back of interference in the 2016 US Presidential Election campaign, where Pages which looked like regular business and fan accounts were actually fronts set-up by foreign organizations, who used those Pages to influence voter behavior. As you can see, Facebook will also enable users to look up a Page’s history, which will show if the Page has changed its name, another potential indicator of bad actors. This latest update comes on the back of various other new Facebook transparency initiatives - they’ve also added info labels for Branded Content Partnerships, disclosure tags on ‘issues ads’ (relating largely to political-based topics) and their new ad transparency tools, which enable users to view all the active ads being run by any Page at any time. Facebook also notes that these latest updates will also be coming soon to Instagram, providing a broader overview across the two Facebook properties. Some might see this is an annoyance, having to go through another process to maintain their Page management capabilities, but it seems a small price to pay in order to deliver a more accountable, transparent process. Of course, for the tools to be truly effective, it will mean that users will need to click through and check the details, but really, it will only take one person to do so to seed doubt about a Page’s motives. For example, if people were sharing a post from the above cited ‘Black Matters’ Page and one of the users who saw it decided to check, then comment that the Page was being managed from Macedonia, that would likely cause others to second-guess the info, slowing the share momentum of the content. Not everyone will bother to check, the same as not everyone will bother to look up the ads being run by a Page, or who’s behind funding for political posts. But if a few people do, and they share what they find with others, that could significantly impact the flow of misinformation on The Social Network.